Ugh. Lately, I have been complainful. So many things are going right. The things that aren't going right seem to be winning. I've given them power. I've strengthened them by awarding them so much attention. It's all home based stuff. There's not much improvement from my earlier posts that were full of laments about my building. I'm approaching six months in my new apartment (which seems impossible!) and I'm still frustrated with the same things from month one! What to do? I've done all of the communicating, reporting, asking, demanding, documenting that I can... yielding little results. So. As my friend Randle put it, I have six more months to move on or move on. Basically, move on in my thoughts and get over it, or move on as in, move out. I'm grateful for a warm roof over my head, don't get me wrong. But this is supposed to be my Home Base. I mean, it's technically All Good Things Headquarters! Sadly, that is in name only. Good things in my building are few and hard to come by. Home Base. What does that mean? You're safe! You made it! You're secure! You scored! I feel none of those things. To get me through the rougher days, I have been employing one of my favorite tricks: The Rampage Of Appreciation! I wrote about it in the Go On A Rampage post a few years ago. Here's a refresher. The spiritual teachers Abraham-Hicks have a process called “Rampage of Appreciation.” It is from one of my all-time favorite books Ask And It Is Given. It is one of my tools for chasing the gloom away and remembering how blessed my life truly is. They teach that the more you find something to appreciate, the better it feels, and the better it feels, the more you want to do it, and the more you do it the better you feel, and so on. The result being the things that you desire can easily flow into your experience. What do I appreciate about this move? I appreciate my grocery store. I appreciate my post woman. I appreciate my taco joint. I appreciate cab rides down the Henry Hudson Parkway. I appreciate High Bridge Park. I appreciate being 2 blocks from Sylvan Terrace and the historic Morris-Jumel Mansion. I appreciate the sunlight that fills my home. I appreciate being 2 blocks from the subway. I appreciate my street and all the opportunity it affords. 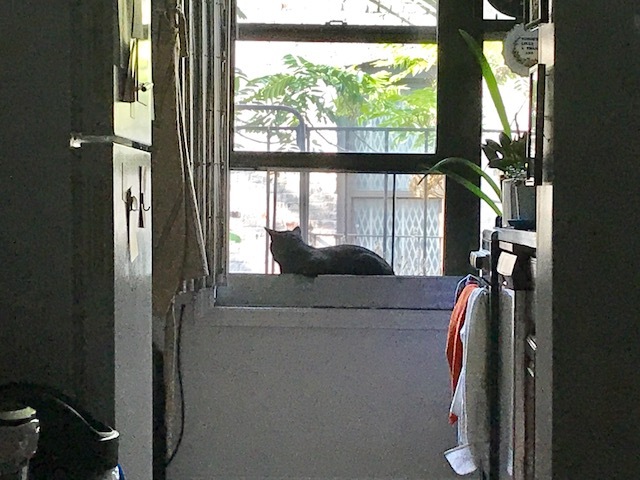 I appreciate my windowsills for my plants to grow and that my kitty Franklin can see the outside world from his windowsill perch. I appreciate that around every corner in Washington Heights, someone is throwing a party. I appreciate the mural on the women's home that greets me when I get to my block. It's giving those women and their children a Home Base. I appreciate all of my nearest and dearests for making the journey uptown to warm my new home with their love and good wishes. There! I feel much better. I'm consciously welcoming more goodness into my living situation and crowding out the things that drive me crazy by focussing on what brings me joy. If you seem to be stuck on something that's bringing you down, I invite you to go on your own Rampage Of Appreciation. There's a saying, "What you appreciate, appreciates." By expressing gratitude for something, it automatically goes up in value. I'm going to do my best in the next 6 months to not let the yucky stuff win. Stay tuned! One of the ways I've also soothed my notsogreat Home Base woes is squeezing the last of the summer heirloom tomatoes into every menu possible. They're so gorgeous in color and shape and even the ugly ones are delicious. 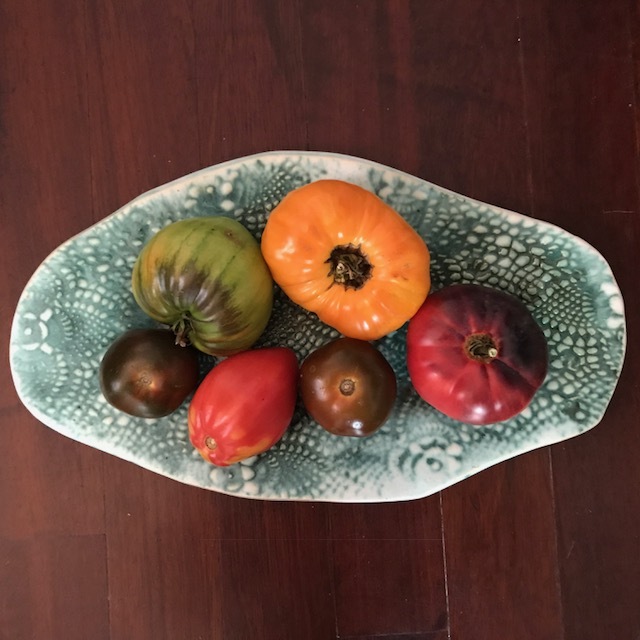 When the first heirlooms appeared at the beginning of summer, I paid up to $12/lb. These beauties are bringing up the rear of the season's harvests and were only $3.99/lb. Now let's appreciate THAT! One of my favorite salads is Panzanella. It's a tomato and stale bread salad. There are a zillion versions of this Tuscan summer dish. You can add radish, cucumber, capers, olives, cheese. It's kind of anything goes as long as you have tomatoes and bread. Here is my latest version. Preheat oven to 400 degrees. Mix 2 tablespoons of olive oil with the chopped garlic and spread it on the bread slices. Bake the bread on a sheet pan for 10-15 minutes. Remove the pan from the oven, cut the bread into 1" cubes, and leave them on the counter for a while to completely dry out. Toss the garlic bread cubes, tomatoes, avocado, peppers, onion, and basil in a bowl. Drizzle the remaining olive oil and vinegar over the mixture. Season with salt and the peppers generously. Toss again. Let the salad sit for at least 20 minutes so the bread will soak up the tomato juices and the dressing. Here's to appreciating your own Home Base!